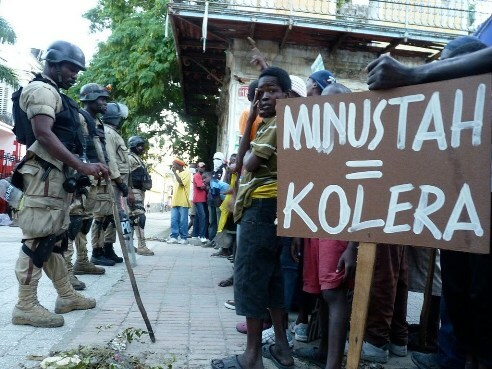 On July 5th the United Nations refused, again, to countenance the claims of 5,000 cholera-affected Haitians against it. The Haitians contend that grossly inadequate sanitation at a UN peacekeeping base introduced and spread the disease through the country’s waterways. The great weight of scientific evidence is on their side. The claimants seek millions of dollars in damages, installation of a sanitation network, and an apology. After years of investigation and controversial suspicions, a new Yale study is holding the United Nations accountable for what was the first cholera outbreak in Haiti in over 100 year, and what has become the largest in the epidemic world. It is now all but certain that Haiti’s cholera epidemic, which has killed more than 8,000 people and sickened more than 600,000, is directly traceable to a battalion of U.N. peacekeeperswho arrived in the country after the 2010 earthquake. The United Nations and its peacekeepers have done immeasurable good in Haiti and elsewhere, but in this instance they bear responsibility for unleashing one of the world’s most devastating recent epidemics. Despite much evidence to the contrary, for nearly three years, the United Nations has categorically denied that it introduced cholera into Haiti after the country suffered a devastating earthquake in 2010. Since then, cholera has killed more than 8,000 people and infected more than 600,000, creating an ongoing epidemic. As new cases continue to emerge, and the UN’s legitimacy continues to erode, it is time for the organization to apologize and take responsibility for the consequences of its actions and its inaction. To date, and despite the mounting evidence and calls for restitution, the UN has not taken responsibility for its deadly actions in Haiti – actions that have led to the death of three times more people than the attacks on the US on September 11, 2011. And now it is using the cholera outbreak that it brought to Haiti as one of the main reasons for its continued presence in Haiti.